VisualEyes is web-based authoring tool developed at the University of Virginia to weave images, maps, charts, video and data into highly interactive and compelling dynamic visualizations. Click on the image above to watch a short screen-cast about VisualEyes. 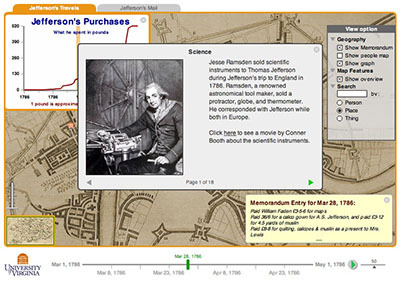 VisualEyes enables scholars to present selected primary source materials and research findings while encouraging active inquiry and hands-on learning among general and targeted audiences. It communicates through the use of dynamic displays – or "visualizations" – that organize and present meaningful information in both traditional and multimedia formats, such as audio-video, animation, charts, maps, data, and interactive timelines. The effective use of the visualizations can reveal and illuminate relationships between multiple kinds of information across time and space far more effectively than words alone. Flash required:The live visualizations require Adobe's Flash plug-in v9 or later.